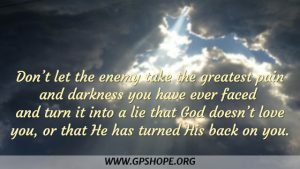 Don’t let the enemy take the greatest pain and darkness you have ever faced and turn it into a lie that God doesn’t love you, or that He has turned His back on you. When God created us, He did an amazing thing. One of the ways He made us in His image is by allowing us to think our own thoughts. He does not control our thoughts, even though He could. He even allows us to think He is the evil one. I remember times when my kids blamed me for something and were angry with me when I wasn’t the one who caused the pain, or my decision was based on something I could see that they could not. It’s the same way with God. He allows us to have our own thoughts, even if we believe a lie about Him. That is how much He loves us. He doesn’t force us to trust Him or love Him. He lets it come from our own choice and our own thoughts. The truth is, the only powers great enough to keep me from living out my kingdom inheritance here on earth are lies and deception. It isn’t the death of my daughter, or any other tragedy I have experienced in my life. 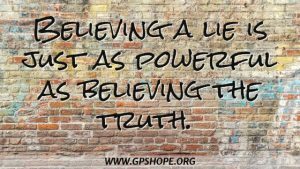 And in case you aren’t aware, believing a lie is just as powerful as believing the truth. The best way I know to get out of the enemy’s sticky web is to still your soul, quiet your own thoughts, and ask God to give you His thoughts. You need to be transformed—totally changed—by the renewing of your mind (Romans 12:2). Allow God’s thoughts to speak softly to you in the depths of your being to set you free from the turmoil. Sit quietly in His presence, letting His thoughts reprogram your thinking. What you focus on is what you will grow. So, if you continue to focus on the pain and loss, it will grow until it is ready to consume you and overtake you. But if instead you think about, focus on, and give thanks for what or who you still have, that is what will begin to grow, and eventually it will bring you out of that deep dark place. 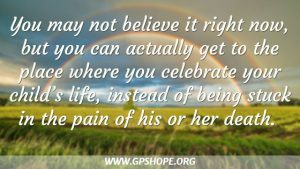 And you may not believe it right now, but you can actually get to the place where you celebrate your child’s life, instead of being stuck in the pain of his or her death. Another way to help change your thoughts is through gratitude. I know we can feel like we have nothing to be thankful for, but once again, that is not the truth. Gratitude is powerful, and it has worked for countless other grieving parents. You can experience for yourself that when we make the choice to flip the switch and find things to be thankful for, we will start to see a change happening in our lives and feel the pain of loss lighten. 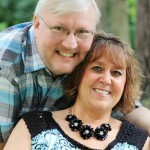 The Bible tells us that we are to take every thought captive to make it obedient to Christ (2 Corinthians 10:5). One reason this is so important is because our thoughts become our words, and words are extremely powerful. We see that all through Scripture. For something to be released, we have to decree it; we have to declare it. We don’t have to feel it, but somehow, we have to push through to get ourselves to speak the truth of what God says. We can’t just wish this pain wouldn’t be so intense. We can’t keep saying we will never get better or will never be able to live without our child here with us. We need to speak God’s Words and truth into the circumstance and into our pain, no matter how much our feelings are the opposite. Remember, believing a lie is just as powerful as believing the truth. And speaking out those beliefs will make our thoughts even more solid – either the lies, or the truth. I heard God speak to me about the way I was thinking, well over a year after I lost Becca, as seen in the journal entry below. 1/16/13: Let’s go back to perspective. You have been stuck on how difficult your life has been. I want you to spend some time meditating on the good, on the blessings, on the wonderful and joyful things. Let’s “reprogram” you and your thought process! The last thing I will share that has helped me personally, was to realize God isn’t just “out there” somewhere. He is actually inside me. 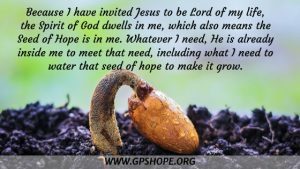 Because I have invited Jesus to be Lord of my life, the Spirit of God dwells in me, which also means the Seed of Hope is in me. I don’t have to wait for God to come to me from somewhere out there. I can quiet myself and listen to His still small voice from inside of me, speaking peace, bringing comfort. Whatever I need, He is already inside me to meet that need, including what I need to water that seed of hope to make it grow. The amazing thing is that He is also sitting on His throne at the exact same time. And I can come boldly to that throne of our gracious God to receive His mercy and find His help which I so desperately need, over and over again (Hebrews 4:16). Just because I have thoughts or feelings about something, no matter how strong, does not mean they are necessarily based on the truth. I pray that you will seek for the truth in your thoughts, because the truth sets us free from being chained to the darkness of our grief. 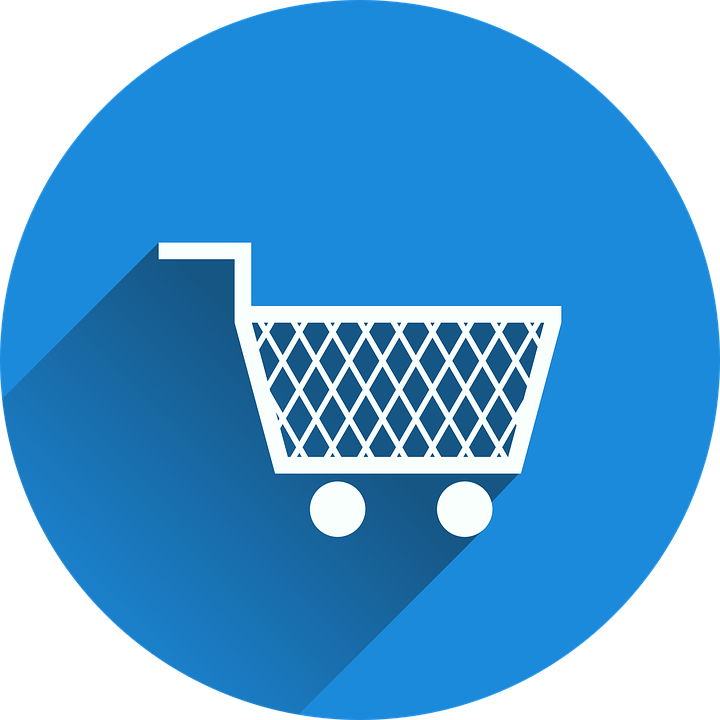 The five most popular Expressions of Hope Blogs written in 2018 were made into an eBook (which includes the one mentioned above, How Can I Still Believe God is Good After the Death of My Child?). We would be happy to send you a free copy if you will let us know where to send it. Nancy, I am so glad it helped you. Thanks for letting me know. I pray we will continue to seek and walk toward the truth, that sets us free. Love and hugs to you.